Gotta love a good ankle boot! Wish it was too hot to wear them here, but the temp is perfect for ankle boots! Love your shorts too! Short wear I believe is a thing in the past here. At least for the remainder of this year. You look great and I love your ankle boots. I agree they are so versatile. I absolutely love them paired with skirts. I have a pair of high ankle boot I rock here and there. You look great. ankle boots are my favorite -- they look good with everything! unfortunately, it gets too cold/snowy for them in the winter, but they are fair game in fall, spring and summer! i just got a pair of ankle foots and am still figuring out the best way to wear them ha. but they're so cute! Totally with you on this--I basically live in my black cut-out ankle boots! I really love the style of yours, and have been looking for a similar pair! Also, the rest of your outfit is beautiful--it is so cool how it looks like your shirt drips/blends into your shorts! I love this look on you! 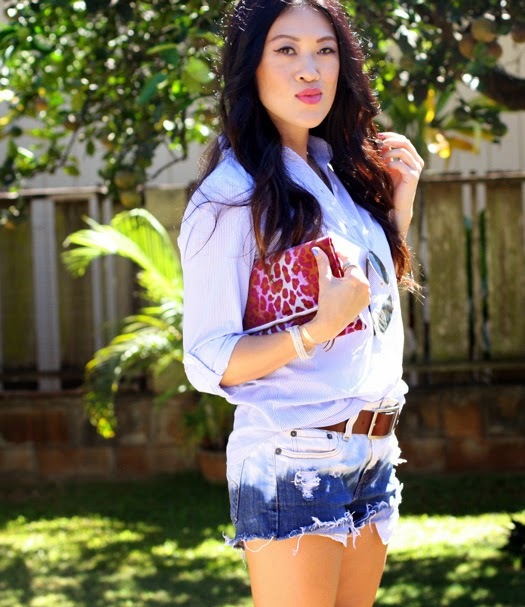 You have the best legs to pull off shorts and booties! I love the ankle boot as well and how it can go in any season under shorts in the summer like your outfit or under a dress or mini skirt with thick tights in winter. I like your outfit! Your hair looks great. Ankle boots are so cool and the styles that are coming out are amazing! You look awesome Becks. I cannot get away with wearing ankle boots, I'm too short and they make me look even shorter. I still own a few pairs from my office days but they rarely see the light of day anymore.